Whipping recipes into submission: efforts to conquer high altitude baking. Oh, and a book. 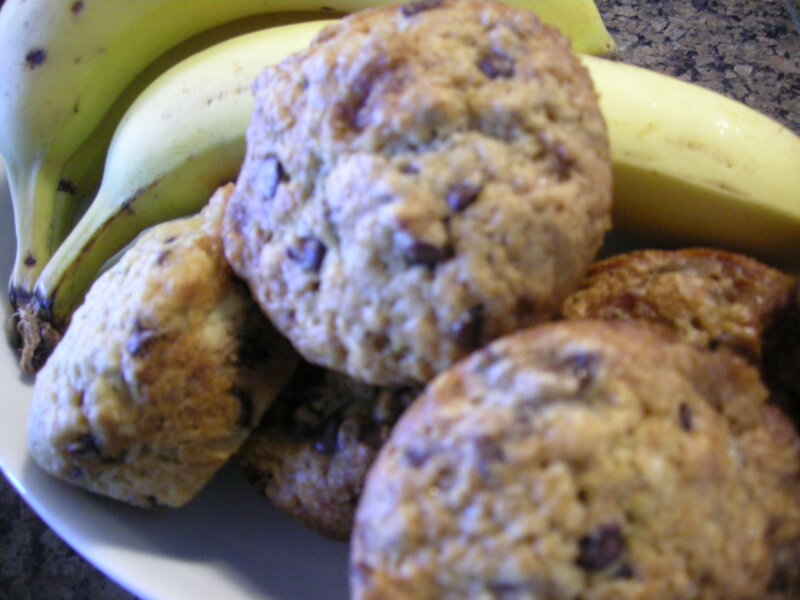 Bananas and chocolate chips–what more do you want from a breakfast? I mean, really? They’re everything you could want to start they day: a happy little marriage of muffin and cupcake…like muffin-cakes…or cu-ffins. While I can’t personally attest to their flavor (they’re not vegan), I can tell you that my devoted, loyal piggies absolutely raved about them. And even better, my little house stunk like an absolute dream for two days after baking these–so score. Preheat oven to 400. Prepare your muffin pans by inserting some o’ them high-class, newfangled fancy-pants paper liners, then set aside. Whisk together the flour, sugar, baking powder, baking soda, and salt in a large bowl. In a medium bowl, combine the egg, vanilla, milk, oil, and bananas. Add these combined wet ingredients to the flour mixture, stirring just until well-incorporated. Stir in the chocolate chips, just until incorporated. If you’re feeling a little crazy (read: nuts–har, har…), add some chopped peanuts too. Yum…peanuts. Plop that gloppy batter into your prepared muffin cups and bake them in your toasty oven for about 20 minutes…until they’re lightly browned and the pass the famous toothpick test. 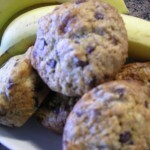 This entry was posted in Muffins, Recipes and tagged bananas, chocolate, chocolate chips. Bookmark the permalink. Wow! These are perfect high altitude muffins. I added the peanuts–delicious. Thank you from a Denver baker. I’m thrilled that you made these and so happy that you enjoyed them! I hope you’ll try some more recipes soon and let me know your results.